Machining and shift ramps are top-notch. 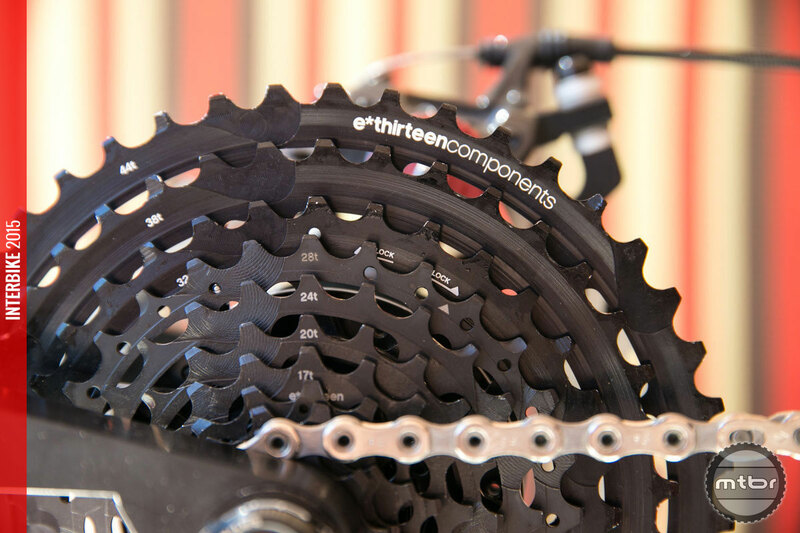 One of the best things we saw at Interbike is this fascinating 9-44 tooth EXP cassette by e*thirteen. It one-ups the the legendary SRAM 10-42 cassette on both ends of the spectrum. Shimano delivered an 11-40 tooth cassette earlier this year and users were up in arms about the lack of range resulting in a 11-42 addition. Is there a need for a range this wide? 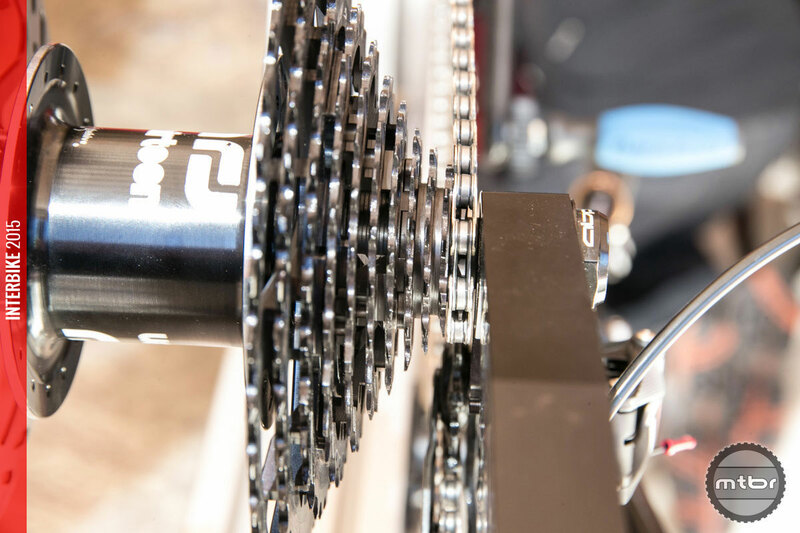 Many riders with good power to weight ratio are perfectly happy with the standard SRAM 10-42 cassette. Though not as wide a range as 2x systems, riders are able to optimize the front ring for their needs and they muscle up a bit on the steepest climbs. But many riders are not as strong and/or they live in very mountainous areas with very long and steep climbs. So there’s always a need for a wide range 1×11 system. This system by e*thirteen is fascinating since it uses the SRAM XD Drive hub as the base platform. It aims to extend its range by going down to a 9 tooth as the smallest cog and going up to a 44 tooth as the biggest cog. This extends the usability of the 1x drivetrain to many more people who feel they are undergeared when using a 1x system. Some might think the 9 tooth cog is a bit unnecessary but aside from achieving higher speeds, it allows riders to select a smaller ring up front like a 30t or 28t if they so desire. 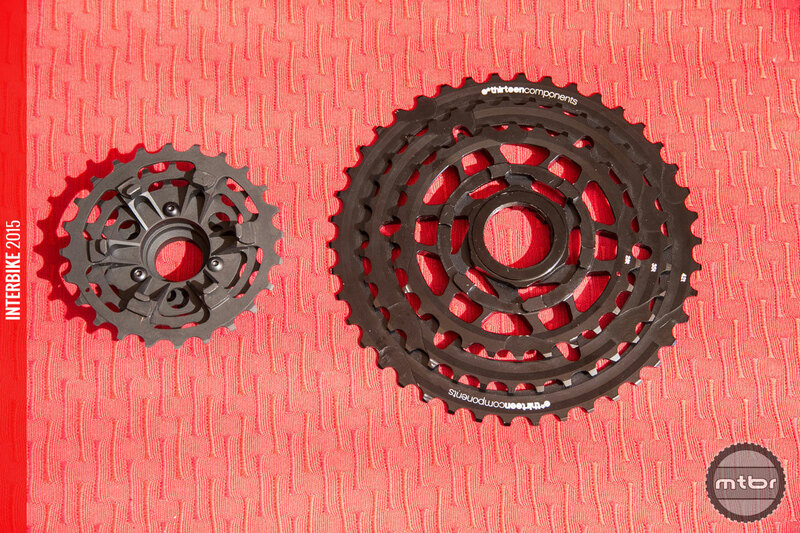 Cassette tooth jumps are closer on the smaller cogs than the large ones. This cassette is designed as a unit so there’s less compromise in shifting performance unlike the many big cog replacements available. 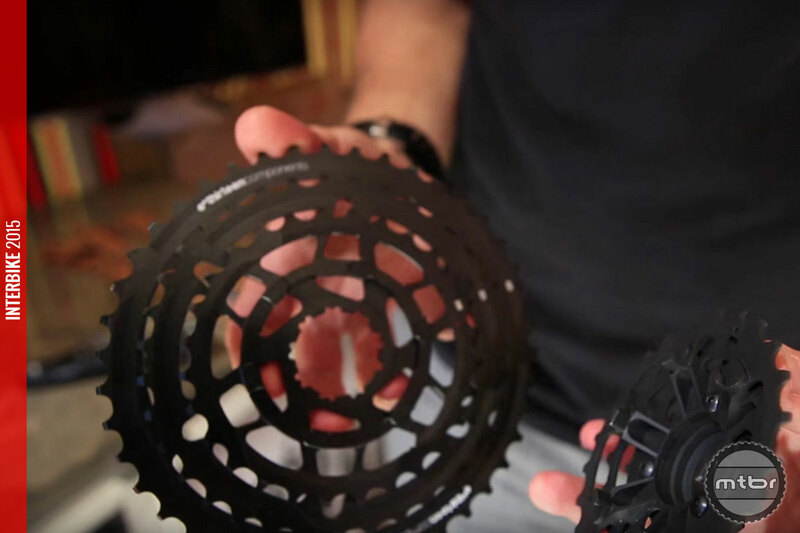 Similar to the Praxis 11-40 10 speed cassette, the e*thirteen offering will have cog sizes that are optimized for each other. Every shift jump is controlled to deliver good performance. If you are a 2×10 or 3×10 user and are wary of the heavier gears on a 1×11, then you may be the perfect candidate for this product. Not everyone can turn a 1×11 10-42 gear and heavier riders are sometimes left on their lowest gear with four miles to go at elevation. This cassette truly gives the range of most 2×10 systems in a 1×11 package. Downsides are the cogs are widely spaced and shifting may not be optimal. Also, we are not sure of the performance of the the SRAM derailleur with the 44t big cog. Finally, this is dependent on using the SRAM XD Driver system so Shimano 10-speed cassette body hubs are not compatible. For more information visit bythehive.com/e-thirteen. Range is an unprecedented 9-44 teeth. The cassette comes in three replaceable modules. didnt 9T get rounded faster? Yes. 9t will wear out faster. Not much time is spent on that cog though. Web site shows that the 3 biggest gears are aluminum alloy. The rest are steel. The aluminum cogs are also replaceable. Hoping you test one of these at the first opportunity. The cog spacing looks too big for racing, but absolutely fine for trailbike use. Are these cassettes aluminum or steel? If it’s aluminum I’ll pass. I’ve worn out, bent or broken several giant cogs already and the aluminum cogs on a Praxis cassette only lasted 6 rides for me. Cassette parts need to be steel, all this alloy stuff is bunk.